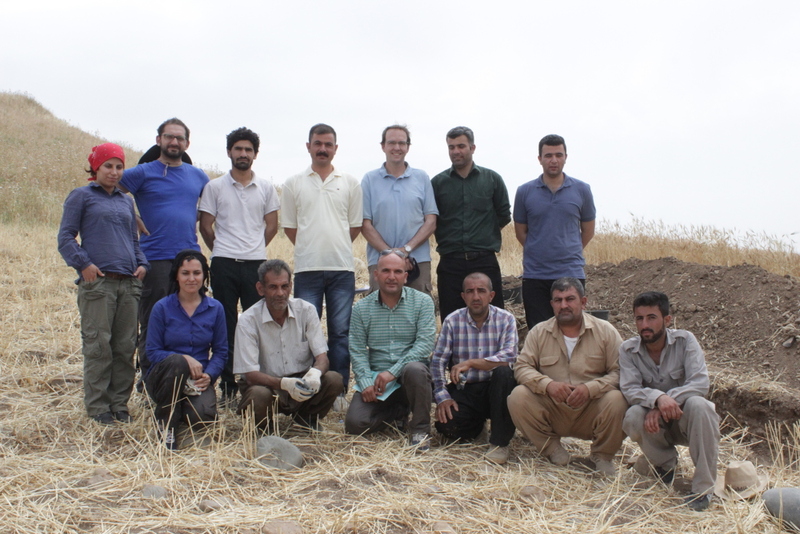 The team members of the first excavation season at Dinka (figure 1) were Dr. Florian Janoscha Kreppner (field director, LMU Munich & FU Berlin), Dr. Andrea Squitieri (documentation, LMU Munich), Hero Salih Ahmed (representative, trench supervisor and pottery processing, Sulaymaniyah Antiquities Directorate), Awaz Jihad (representative, trench supervisor and pottery processing, Sulaymaniyah Antiquities Directorate), Aziz Sharif (driver, Sulaymaniyah Antiquities Directorate), Ibrahim Manla Issa (cook, Erbil). Six workmen were recruited for the excavation, to which four more were added during two days of excavation and in the backfill day. The photo also shows some visitors to the site. 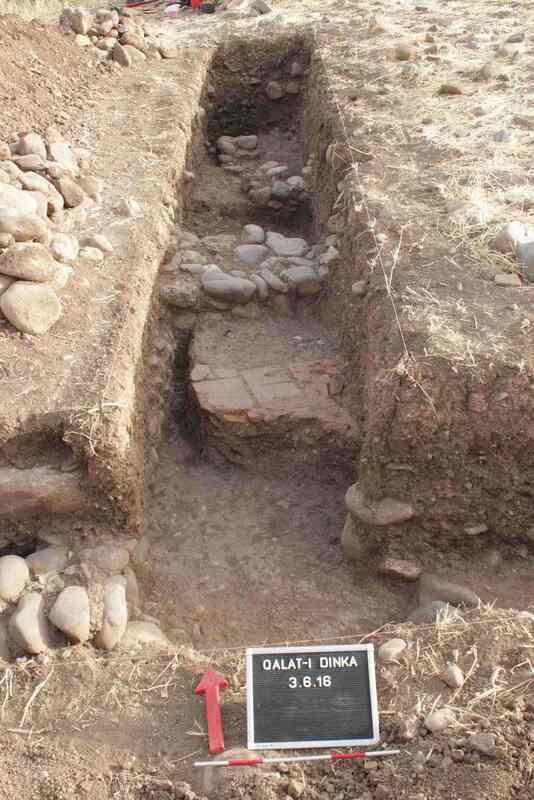 The archaeological excavation at Qalat‐i Dinka (hereafter Dinka) was inaugurated in May 2016 within the framework of the Peshdar Plain Project to protect the cultural heritage under threat by agricultural and building activities. After establishing a local grid, we started the excavation by creating a T shape trench with its short side roughly oriented towards the North (figure 2). The T trench’s longest side is 20 m long running roughly East‐West, divided into the so-called Eastern and Western trenches; the other side measures 8.5 m in length, runs North‐South, and was called the Northern trench. All trenches are 1.5 m wide. In 9 days of excavation we uncovered an area of 42.75 m². The oldest feature detected was the virgin soil. A packing material covering the virgin soil was identified in the northern and eastern trenches running below all the walls excavated. A substantial architecture has been uncovered, with two walls ca. 2.10 m wide, both oriented roughly NE to SW, and a brick pavement (figures 3-4). The size of the bricks does not conform to the known Neo‐Assyrian brick standard, which may suggest that the bricks were made on a local standard. 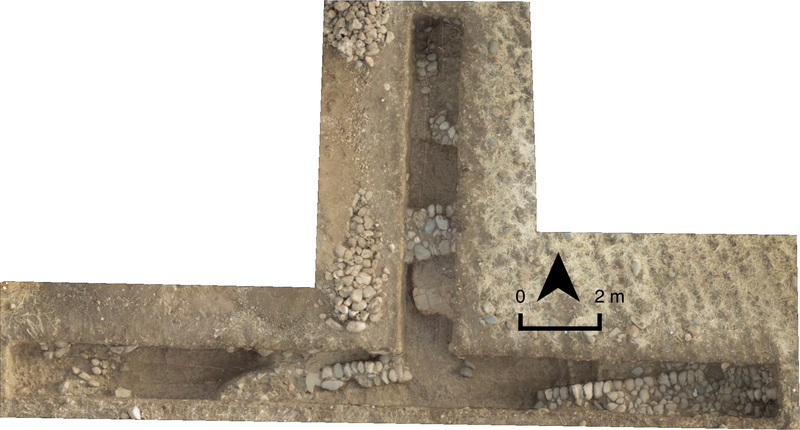 A floor was found abutting wall 16, with Gird‐i Bazar pottery type vessels resting on it (figure 5). This datum is very important because it indicates that the main occupation in Dinka occurred at the same time as at Gird‐i Bazar. 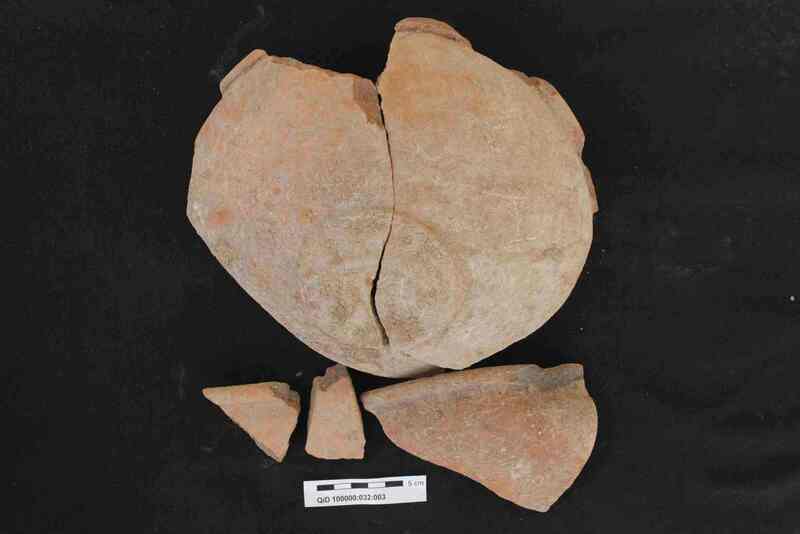 It has become clear that the area of Dinka excavated was characterized by only one main occupation phase, despite the settlement being on a slope. Moreover, the relevant archaeological features seem to be quite close to the surface and not too deep. This causes the stratigraphy of the site to be quite simple. It seems that the area was reused as a graveyard in a later phase, although it is worth noting that we identified only one proper grave pit. We can infer the existence of other graves only from the huge quantity of human bones recovered from the looting pits (see below). 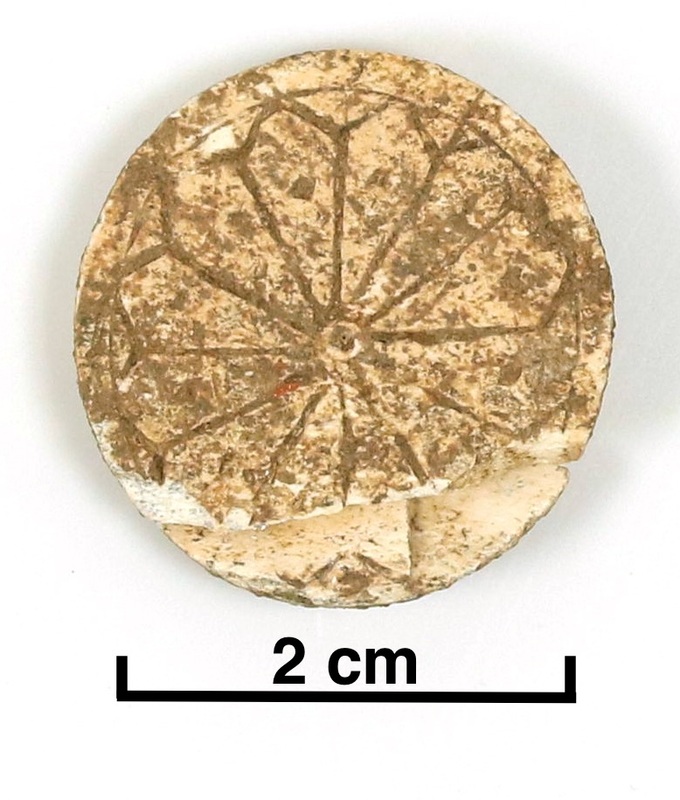 This grave yielded many small objects, especially beads and ivory fittings, that could still be within the Iron Age horizon (figure 6). The chronology of this grave should also be clarified in later research. 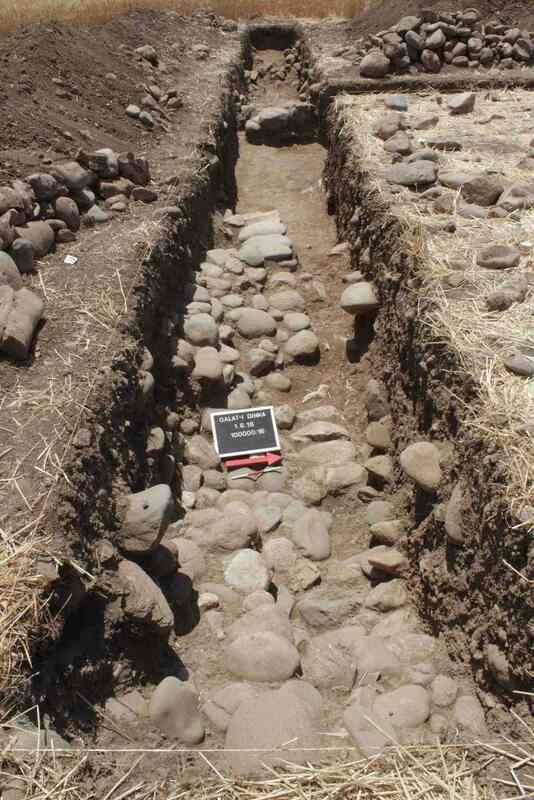 The area we excavated was later damaged by many looting pits. The huge amount of human bones coming from the looting pits seems to indicate that the robbers destroyed the graves. A bracelet found in one of these pits may have been lost or overlooked by the looters and may therefore indicate that the graves were originally equipped with precious objects. In conclusion, it seems that the area houses substantial architecture that may belong to monumental buildings, as is indicated by the large walls and the pavement we found. The large walls seem to belong to the same phase as the small walls. Although it is too early to offer a conclusive interpretation of the general layout of the area because the portion excavated is too small, it is possible that the area with the pavement functioned as an open area bordered by a wall, and to the east by a possible staircase following the slope. Finally, the results of this first excavation season are very promising. We found evidence for an Iron Age single phase occupation, which is not too deep under the site surface. However, the negative aspect of our investigation is that it seems that the site has been severely damaged by looters in the recent past. It is necessary to continue the research at Dinka to obtain a better idea of the layout and functional organisation of the site.